I just met a friend at a SQL Saturday who let me know that he recognizes my name because it was attached to a project I wrote five years ago. The “Blocked Process Report Viewer”. I was impressed. I’m glad to know that it’s still used. So I decided to update it for 2016. 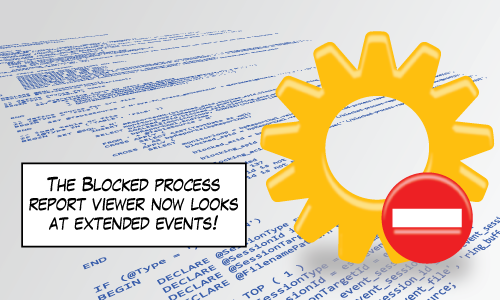 I’ve extended the Blocked Process Report Viewer to look at blocked process reports that were collected with extended events session. The value of the blocked process report viewer is that it organizes all the blocked processes into “episodes”. Each episode has a lead blocker which is the process in the front of the traffic jam. Look at that process closely. Let me know how it goes. Tell me if there are any errors or performance issues. I’m especially interested in the performance of the viewer when given extended events sessions that use ring_buffer targets. Thanks Yarik, I’ve fixed it. Yet another great tool/tips from Michael!! Thanks for this very useful tool. I read about this tool before but never got chance to look into it. Today, I decided to give it a try and it was working fine. I used to run this session for longer period of time times , so value for “monitorloop” has lot of different values. “monitorloop” is defined as “nvarchar(100)” which breaks ordering. I have changed “monitorloop” column’s datatype to decimal(38,0) for now and its working fine for me now. I have checked this on Microsoft SQL Server 2014 (SP1-CU4). Thanks for the feedback Chintak. I’ll get this in as a fix this week. Thank you, Michael! It’s 2018 and it still runs like a charm. Wow! Glad to hear it Thiago! In cases like this, how would you proceed to learn what was the statement of the original blocking query? The closest I reached was using the waitresource info (OBJECT, PAGE or KEY), which gives me the exact resource being locked by session s1. However I need the statement executed that caused the blocking. Is there any way to do it besides running a Trace/xEvents? As you’ve already discovered, the blocking transaction has moved on from the particular query that locked table A.
I either deal with small transactions (in terms of number of statements) which makes discovering the first statement by inspecting the text of a procedure or batch easier. But that doesn’t help you. I don’t know of any way off the top of my head (other than trace/xevents) that can indicate which query of a transaction took the lock. And I think maybe that’s the best we can do. I imagine it would be very difficult for SQL Server to track the relationship and history of the relationship between locks and queries. Especially for very large transactions. Michael, thanks again for your insights and I wish a lot of success for you. I am in a blocked Process overload. I started with WMI events and Alerts but for some reason could not get them to work. I found your Blocked Process Viewer on Brent Ozar’s page and started looking into it and I think I have missed a step and I am not sure where. Is there a literal step by step instructions for someone who is a little burned out (alottaBurned out) to follow to get this instituted correctly? There’s two parts. Collecting blocked process report data and then viewing it. Specifically the section called Collecting Blocked Process Reports and Deadlocks Using Extended Events. Once you believe you should have captured something, try looking to see if anything is there by expanding the extended event session. Then try viewing it using the blocked process report viewer.